This is a model built to professional specifications and is based on the AT-X 828AF optical system. Tokina has utilized coating changes in the optical system and the unique floating element system separately focuses the first three and last two elements in the forward lens groups. This provides uniformly high image quality from infinity to close focus. The new exterior finish improves overall handling and durability. A focus clutch mechanism further assures top performance during auto and manual focusing. Somewhat heavy. Shade is a pain. 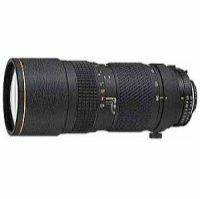 Bought to replace canon 70-200 f/4L. Wanted to try a faster lens. Overall it is great. I have found it searches a little in dark situations but I think that is me getting used to it. Built like a tank. Can anybody tell me about the metal shade cover. How does it come off etc? Overall quality is high based on dollars spent. Fast lense and highly rugged and resiliant construction. Comes with a tripod mount on the lense. Focus ring has solid feel and makes it easy to get to the settings you want. No slop or loose feeling mechanism, as I have experienced over time with more "name brand" lense setups. Nice size and configuration gives a good control of the lense during the shoot, even off a tripod. I like to take nature shots, and this lense does it for me, even in less than perfect light levels. People clain a soft f/2.8, but I have not experienced it with mine. I have had mine for many years, but do not see any manufacturing changes since my purchase. The only weakness is from purists who insist only "name brands" can curry their favor. Quite frankly, nothing will ever satisfy them. Let them spend 4 times as much for similar quality. I know what has worked for me, and done so for the long haul. Simply one of the best of my Canon lenses. I have been through many in the past 20+ years, and this lense has held up to the test of time. I have watched other lenses hit the market with similar specs, at many times the price, and I have yet to find a more compelling piece of hardware. It simply "does the job" of etting the shot I want, when I want it. People say the f/2.8 is a little soft, but I have had no problems at that stop. The high speed gets the image for me. Never had occasion to use them. My lense has been the perfect companion. Build quality and optical performens! Like every other f 2.8 lens, it's better stoped down to f 4. Of all lenses i have used, this is the one I trust the most. The build quality is superior to everthing I have come across, and it is allways with me on nature shoots. best strong build, heavy, solid, great optics, best price, great looks, got tripod collar a big plus.comes with big hood and nice leather case.very pro feel and looks. only complain i have is for those whos bashing tokina atx.im pround to have replaced it with my others canons and nikon lenses.tokina is way of shooting. i have just sold both of my nikon g lenses to get this tokina atx pro f2.8 80-200mm..after a month of testing it out, i must say its the best lens in its range..no doubt, i love it..its beats all nikon in its price range..i sold my 3 nikon lenses. 24-120mm, 18-55mm, and 28-200mm, to replace with this tokina atx..its got all the beef i want..its got best build, quality, design, great optics, awesome results in pics, very sharp in all ranges, nice colors, very contrasty...what else does one can ask for? , its a perfect lens for my shooting..i use it on my fuji s2 pro, also , i have the tokina atx pro f2.8 28-70mm and the sigma 15-30mm too, its the best combo any fotoman can have..best buy, go out and buy all these 3 i mention here, u'll be 1 happy fotoman..and save money too.trust me..i give it a 6 stars.lol. Some softness in F2.8 but consider the low price, it worth every penny. Manual focus ring is not as smooth Focus hunt especially at low light condition. The build quality is excellent, solid and you can feel the robustness of it. Optical quality is excellent, especially at F3.5 to F8. F2.8 tend to a little soft but acceptable up to 6R print. Good contrast at all range, and when i hooked this up with a 2x Tele converter (tamron), i can still take sharp image at F6.3 @400mm (equiv to 600mm on my Dynax 7D), with Anti-shake on. Strong, durable, great optics/sharp, tripod collar, comes with lens hood & case, fast f/2.8, less expensive than Nikon but excellent optics. I bought this lens over 8 years ago and it has been a workhorse. I use the 80-200 more than all my other lenses combined. As a nature,sports, wildlife shooter I use the lens at f/2.8 and get great results. I was going to buy the Nikon 80-200 but 8 years ago it had no tipod mount. I don't know it there are any major changes in 8 years, but this is an outstanding lens. I have used it with Nikon N90, N90s, F5, and F100 with no probems. I would recommend this lens to anyone who wants tack sharp images and a lens that will last with abuse. This is a great lens. Very sharp for zoom at this range. It gives good color rendation although the contrast not as high as Sigma (I don't like Sigma contrast because it is too contrasy that it lose a lot of detail. Bokeh is nice. I test this lens with Kodak Extra Color and use Leica Pradovit 153 projector. The image is sharp from center to corner throughout all f stops. I would recommend this lens to anyone who looking for a third party lens. Build, optics, AF speed with Pentax MZ-S. Some people think that the noisy autofocus must me slow as well. The Canon lenses I own are so quite, but I do not see a measurable difference in the AF speed when I work with my loud Pentax and whisper soft Canon gear. Both are excellent. Hood is attached to the filters. AF to manual and vice versa swith is difficult to operate. Generally a good lens. It's sharp, and meters correctly on my Pentax PZ-1P. Also it costs less than half of Pentax 80-200/2.8, which is priced at 1299.95 at B&H NY. Good value for casual photographer like me. It might be too heavy for some users. Since I always use a tripod, the weight isn't a problem to me. One minor problem, when you position the lens upward, the zoom drops slowly. So when shooting subjects that require you take a face up position, be sure hold tight the zoom ring. Poor attention to design detail naff tripod collar placement crazy screw on hood design / different thread sizes slow(er) autofocus lens mutli coating doesn''t seem to efficient, may have flare issues. Got this as a replacement for the Sigma EX 70-200f2.8 due to ongoing compatability problems with my Dynax 7. So far, mixed opinions - certainly very sharp, little to chose between the two lenses in these stakes. Also better with its matching Kenko Pro300 2x than the Sigma EX 2x. Build quality is superb, streets ahead of the Sigma in this respect. My bag is now full of nothing but ATX Pro kit. Autofocus is slow and clunky, even with the Dynax7, here the Sigma was faster. I have no need for rapid tracking and the lack of focus compatability problems far outweighs this negative for me. It is not all clean sailing though, I do have serious gripes with the lack of though that has gone into the ergonomics of the design. The tripod collar cannot be used on a body with a vertical grip or a pro body - on mine the quick release lever or the adjustment handles totally abstrust mounting correctly, this is a major flaw for a heavy pro lens. Secondly, that crazy hood. Unbelievable. Screws into the filter mount. Mount on top of filters and you''re into vignet territory. The inside of the hood is also threaded BUT IN 72MM rather than 77!! In other words, with the hood on, you cannot use the 77mm lens cap or your current filter set. I had to buy a step up ring and place this inside the hood. Far from ideal. Hood is also non reversible, so space could be an issue. Using any cokin P or polariser is a pain in the neck. not yet tried, may contact them on the lens hood issue.